The Grand Strand offers plenty of places to get a great meal. Our 60-mile stretch of Carolina coastline is home to more than 1,700 dining establishments, and their culinary specialties run the gamut from fresh-caught seafood and wood-grilled steaks to farm-fresh veggies, international cuisines and everything in between. And of course, with its comfortable climate and stunning scenery, the Myrtle Beach area is also a great place to enjoy the outdoors. Hot Fish Club — Housed in the oldest existing restaurant building on the Grand Strand, this Murrells Inlet seafood restaurant specializes in serving fresh fish procured from day boats and accompanied by fresh local produce. Diners looking to enjoy their meal alfresco can head to the restaurant’s back deck overlooking a marsh, where they can opt for signature dishes such as the Lobster Pot Pie, Char-Grilled Grouper, Blackened Mahi Stuffed With Crabmeat, and Maple-Ginger Glazed Salmon. Visit hotfishclub.com to learn more. Greg Norman Australian Grille — Found at North Myrtle Beach’s Barefoot Landing shopping/dining/entertainment complex, this harborside restaurant founded by golfing great Greg Norman specializes in fresh, wood-grilled seafood, steaks and chicken. 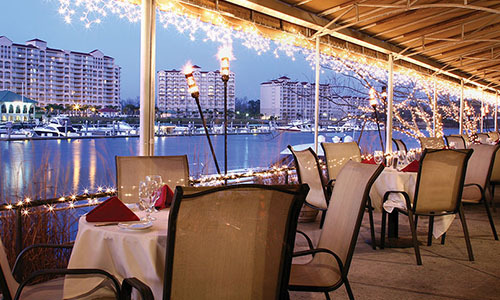 While diners can catch views of the adjacent Intracoastal Waterway from every level of the restaurant, the deck puts them right next to the glistening waters and passing yachts. Learn more at gregnormanaustraliangrille.com. Second Avenue Pier — Accessible to Bay View on the Boardwalk guests via a short stroll down the Myrtle Beach Boardwalk, the Second Avenue Pier offers a pair of great dining options. The Pier House Restaurant serves up fresh seafood, steaks and more — along with magnificent ocean views through its large, right-over-the-water windows. To grab a bite to eat and a drink or two outdoors, head to the attached Pier View Open Air Bar to enjoy some ocean breezes and similar views of the Atlantic with your meal. Menu options include appetizers, seafood, sandwiches, burgers and more. Gulfstream Café — This Garden City seafood restaurant serves up authentic coastal cuisine, including fresh seafood and Southern favorites, along with great views of Murrells Inlet. The rooftop deck is the perfect place to enjoy popular dishes such as She-Crab Soup, Broiled Lobster Tail and Jumbo Lump Crab Cakes while soaking in the beautiful scenery. Learn more at gulfstreamcafe.com. Sea Captain’s House — With more than half a century of history on the Grand Strand, this Myrtle Beach restaurant offers some of the area’s best seafood and one of the region’s top outdoor patios. Guests here can enjoy house specialties like Shrimp & Grits, New England Clam Chowder, Pecan-Crusted Grouper and Filet Mignon while taking in sweeping views of the Atlantic Ocean. For early risers, catching breakfast here along with a sunrise over the Atlantic is a fantastic way to start the day. Visit seacaptains.com to learn more. After your meal, make your way back to your comfortable accommodations at Bay View on the Boardwalk — where some of the Myrtle Beach area’s top outdoor attractions, including the beach and the Myrtle Beach Boardwalk, are right out your back door. Book your Grand Strand vacation today, and get ready to enjoy all the great outdoor escapes and delicious dining options the Grand Strand has to offer.